Reese Witherspoon says that if there's one misconception about Southern women it's that when they say "Oh, bless your heart" they don't really mean it. They do mean it, she insists ... or at least, usually they do. Witherspoon, who was raised in Nashville, celebrates her Southern upbringing in a new book called Whiskey in a Teacup: What Growing Up in the South Taught Me About Life, Love, and Baking Biscuits. The book is full of memories, recipes, design ideas and cheerful photographs, celebrating small moments with family and friends. The title comes from a phrase she remembers her grandmother saying: "Southern women are like whiskey in a teacup ... beautiful and presented well on the outside ... fierce and very strong on the inside." When Witherspoon was young her parents had busy work schedules — her mother was a nurse and her father was a doctor. And so it was her grandmother who picked her up every day after school. "My grandmother raised me ..." she says. "I just learned everything from her — I learned how to read. I learned art. I learned cooking." Years later, Witherspoon still shares her grandmother's love of wallpaper, decorative dinner plates and of course — monograms. She talks with NPR about Southern women, Southern charm, and the changes she sees in Hollywood. I just think you can't go wrong with a great cheese plate ... I just try to keep it light, too, because mainly people just want to drink wine. Let's get real. People just want to drink wine and talk about their lives and then talk a little bit about the book. I just I think it's so beautiful. It's such an art. It's something that I was raised with and then when I moved to California nobody did it, and I was so confused why everybody didn't have monograms on their towels and their sheets and their cups and their plates. ... I don't know where that tradition came from ... My daughter had to eventually say to me, Mom stop putting my initials on everything. I'm not from the South. When I moved out to California when I was 20 I think people thought I was being fake because I was so friendly. I had a long time trying to make friends because I think people thought I wasn't being genuine but that enthusiasm over meeting people and genuine interest in other people is just that — it's very real. One thing that really in my mind defines Southern women is that they have very strong boundaries. And there is a warmth there but there's also a ferocity ... to protect your family, or your friendships, or your husband, or your children. There's definitely an idea of don't cross the line with me. ... They always they start with kindness, but really, don't mess with a Southern woman. Someone said to me the other day: We're running out of female directors because people are seeing this absence of female authorship and are trying to right the ship and correct themselves and hire more women to direct television shows, to direct films. ... We don't have enough women to employ because a lot of them didn't even bother to get started in a profession that they felt like was a dead end road. So it's incumbent upon us — you know, women, and other people in our industry that have leadership positions — to mentor. I think it's all about identity and owning where you're from and what your unique story is. ... No one should tell your story for you. You are the unique author of your own life and in this world where everyone has a platform, and everyone has an opportunity with social media to really get their voice out there, I think it's important to speak up and speak out — particularly if you've been part of a community that feels marginalized or unheard or unseen. I hid all the junk for the pictures! Come on! When you know somebody is coming over to take a picture of your house you hide all the toys! ... They can see all the junk on my Instagram. On my Insta stories they can see the real chaos of my life. I wanted to present something that is visually pleasing and it's like, yeah, I cleaned it up for you people. I tried to make it nice. It depends on the kind of morning you're having. Danny Hajek and Reena Advani produced and edited this interview for broadcast. Beth Novey adapted it for the Web. Reese Witherspoon may be a big-time Hollywood actress living the California dream, but she hails from Nashville, Tenn. And she has got Southern in her soul. Witherspoon has a new book out about some of her favorite Southern traditions, recipes and decorating tips. In between, there are stories about her life and upbringing. She titled the book "Whiskey In A Teacup," something her grandmother used to say. 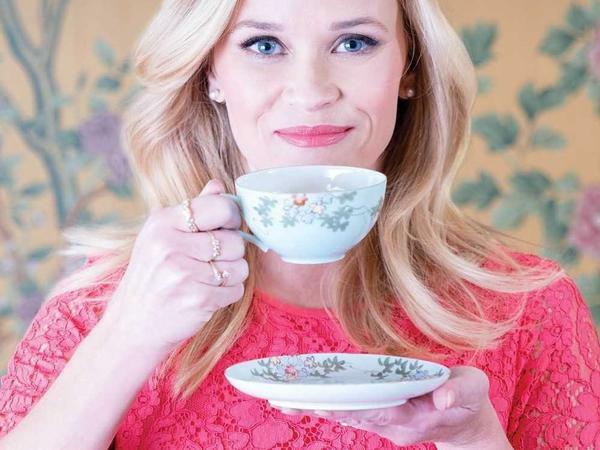 REESE WITHERSPOON: Southern women are like whiskey in a teacup. You know, they're beautiful and presented well on the outside, but they can be fierce and very strong on the inside. MARTIN: Witherspoon shares her grandmother's love of wallpaper, decorative dinner plates, and she's got an entire chapter on monograms. WITHERSPOON: I just - I think it's so beautiful. It's such an art, and it's something that I was raised with. And then when I moved to California, nobody did it. And I was so confused why everybody didn't have monograms on their towels and their sheets and their cups and their plates. MARTIN: You're like, I have no idea whose teacup this is because there's not a monogram on it. MARTIN: Do you monogram your kids' stuff? WITHERSPOON: Oh, yeah. I mean, to a point where my daughter had to eventually say to me - Mom, stop putting my initials on everything. But I don't know why we do that. I mean, maybe it's just so people don't steal our stuff. I don't know. MARTIN: What's the biggest misperception about Southern women? WITHERSPOON: I will say, like, the grace and charm with which they behave is very genuine. When I moved out to California when I was 20, I think people thought I was being fake because I was so friendly. WITHERSPOON: And I had a long time trying to make friends because I think people thought I wasn't being genuine. But that enthusiasm over meeting people and genuine interest in other people is just that. It's very real. MARTIN: ...That they are the storytellers. I wonder if in this moment - now that we're, you know, a year-plus after the #MeToo movement got the kind of national and international notoriety that it has, have you noticed a systemic change happen yet? WITHERSPOON: I wouldn't go all the way to systemic. But I have noticed great change, which is so encouraging. I mean, the amount of female directors that are so gainfully employed at this point - honestly, someone said to me the other day, we're running out of female directors because people are seeing this absence of female authorship and are trying to right the ship and correct themselves and hire more women to direct television shows, to direct films. The only deficit comes when we don't have enough women to employ because a lot of them didn't even bother to get started in a profession that they felt like it was a dead-end road. I would love to see more women of color being employed and directing, more disabled women, more LGBTQ women and men finding their authorship in my business. And I think that's happening. So it's exciting to see baby steps happening and real growth and change. MARTIN: If we circle back to end on the book, I have to ask this - because there will be people who pick this up and flip through these pages and see beautiful photos of you and your home and food and friends and think - oh, my God - her life is, like, so perfect. WITHERSPOON: I hid all the junk for the pictures. WITHERSPOON: Come on. When you know somebody is coming over to take a picture of your house, you hide all the toys. WITHERSPOON: Oh, they can see all the junk on my Instagram. WITHERSPOON: They can see the real chaos of my life. But no, I wanted to present something that is visually pleasing. And it's like, yeah, I cleaned it up for you people. WITHERSPOON: I tried to make it nice. MARTIN: Reese Witherspoon - her new book is called "Whiskey In A Teacup," and it is very nice. Reese, thank you so much for talking with us. WITHERSPOON: Thank you, Rachel. Transcript provided by NPR, Copyright NPR.